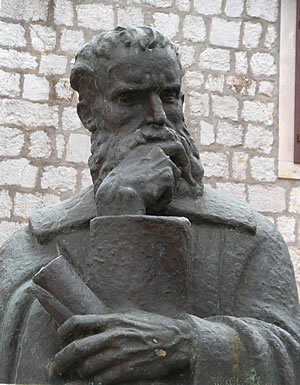 In 1555, Petar Hektorović, that well-known renaissance man, poet and house builder, set out from Stari Grad on Hvar to visit the nearby island of Šolta. By then, Hektorović was 68 years old and this was to be a few days relaxing sailing. With him were a couple of local fishermen, Paskoj and Nikola and all their fishing gear. On the way they called in at Brač, did some fishing, ate and drank, told tales and sang songs. The experiences of this 3 day trip were written down – in verse because he was a poet – and dedicated to Hektorović’s friend, the teacher Jerome Bartučević. He writes it in the traditional dodecameter style of old Croatian poetry, meant for easy memorizing and reciting. Published in 1558 in Venice complete with musical scores and a map, this travelogue in verse is one of the highlights of early Croatian literature. Not all of Hektorović’s works survived the rigours of the late 16th century on the Adriatic coast. It wasn’t exactly a peaceful time, but Ribanje i Ribarsko Prigovaranje (On Fishing and Fishermen’s Tales) survives to give us a wonderful glimpse of everyday activities, real people, and the beauty of the surrounding nature. I love a good travel story, and this one promised to be interesting and entertaining. The problem for English speakers is the obscure language. Possibly also for modern Croatians, as this is written in the equivalent of Shakespeare’s English if he’d been sailing with Cornish fishermen. That is to say, the original text needs footnotes to be understandable to native Croatians, let alone to those of us coming later to the language! They set out early in the day from Tvrdalj in what probably would have been a traditional Dalmatian fishing boat, a gajeta. It was kitted out with a mast and a sail, oars, an anchor, fishing nets and weights – and a good supply of wine. That last item I’m guessing, based on later descriptions of their meals! Heading westwards along the south shore of the Rudine peninsula, they cast their nets first in Zavala Cove. They didn’t catch much of anything there, and the net snagged on the bottom, so they had to use the old trick of sliding a stone with a hole down over the net to loosen it. As they headed further west, a second casting of the net provided a large amount of fish and by the time they reached the headland of Kabal point, a third cast brought a large fish – a zubatac (dentex) the size of a calf with a mouth as big as a man’s spread hand. At that point, the wind was blowing too strongly from the west, so they headed south and put into Lučišće cove where the Bartučević family had a house. Here, they shared their catch with the workers, and a boatload of strangers who were sailing off to Novi Grad, the “new town” as Hvar was then known! Having cooked their fish, they sat down around a stone table to have lunch. Much chat as two jugs of muscatel were consumed. Hektorović’s detailed account contains a rare and important record of the folk riddles that were apparently part of standard conversation at the time. As the sun sank lower, they set out to have a look around the rather beautiful property, followed by dinner and a good sleep! Up early on the second day, they set out for the island of Šolta. The wind was blowing from the northwest, so they were heading fairly close into it. 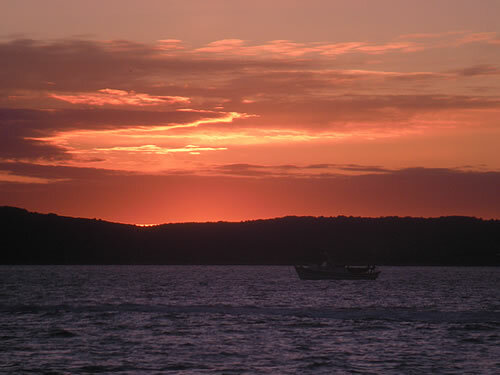 On the way, the two fishermen told traditional bugarščice folk verse of heroic times. Paskoj’s poem was about a well-known character from the 13th century – Kraljević Marko who stabbed his brother Andrijaš, while Nikola told the sad tale of Duke Radoslav being captured. If there was a hidden message in either story, I’m afraid it escaped me, but it does seem that the oral tradition of passing down stories by reciting them in verse form was alive and well at that time. In the heat of midday, they put into a cove on Brač for lunch. Nikola was dispatched up the hill with some money to buy supplies, while Hektorović writes of the joys of a quiet snooze lying in the bottom of the boat under a shade. Once Nikola returned with a substantial amount of supplies (he needed a shephard to help carry it all), they set out again in the direction of Šolta. This time Paskoj and Nikola were rowing, and singing in two-part harmony “I kliče divojka”. Hektorović’s account includes the words and musical notation for the song. After a couple of miles, Hektorović grew thirsty. That was when they discovered that his special cup and jug were missing, presumed left back on shore when they’d offered the shephard a drink. He drank some bevanda (wine and water mixture) from the small cup used by the fishermen, and described how beautiful his own cup was – silver plated with arabic lettering. Not only valuable in itself, but given to him by a very dear friend. Not the most sensible object to bring along on a sailing trip you’d have thought? Anyway, the embarassed fishermen turned the boat around and rowed back to shore, where they found the jug and cup just where they left them. That little episode of the missing cup has been described by later literary analysts as recalling the old grail legends, but I’m not sure I get that. Setting out once again across the channel to Šolta, Paskoj and Nikola sang (or was it recited?) riddles as they rowed. Paskoj was asking the questions – what is the biggest, fastest, most valuable, etc – and Nikola would give the responses – the world, your thoughts, a man’s virtue, and so on. By the time the sun was getting lower, the fishermen had to work harder to reach their planned destination – the little port at Nečujam where Dujam Balistrilić, the godfather of writer Marko Marulić had built his home. Don Dujam had retreated there from Split to become a monk, around 50 years before, building a retreat with a small harbour. Hektorović describes how Marulić was a great writer, the best of many intellectuals that the city of Split produced. By the time they finally arrived after their long day, they had time to have a quick dinner with wine, then fall asleep as darkness fell. On their arrival as dusk fell, they’d simply pulled into the nearest protected shore in Nečujam bay. The following morning, they moved the boat into a better position in the centre of the cove, dropped anchor and went to visit the church. The gardens of the house are described in loving detail, with every plant and herb listed. Beyond the house were orchards with fruit trees of every type, and carefully tended fields. After a successful morning’s fishing, they returned to Nečujam for a big meal – a combined breakfast and lunch. Following that, they set sail for home, propelled by a good fresh breeze. 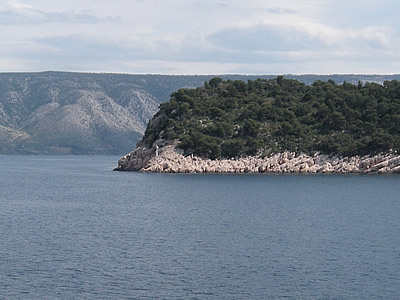 In the channel between Šolta and Brač, they came across a trading galley, rowing between Hvar and Split. The Master of the Galley, recognising Hektorović, hailed them, and invited them on board for refreshments. After a detailed discussion about Hektorović’s house and garden, and giving them some oranges and lemons, the two boats separated to resume their journeys. Paskoj asked who that was, and Hektorević was embarassed to say that he did not remember him! On the way south, the fishermen continued their conversation and riddles. Hektorević was impressed with the folk wisdom showed by what he thought of as simple people, who didn’t have the advantage of book learning, as he did. When they put in at Kabal point to cook some fish for dinner, he was still thinking about it. After the meal, as darkness fell, they set out for some night fishing. Keeping close to the coast, they used a lamp burning resinous pinewood at the front of the boat. The resin in the pine makes it burn brightly, lighting up the water, clear down to the bottom. One of the fishermen rowed, while the other stood with an osti, a long trident with pointed barbs, on which he impaled fish. Hektorović was much taken with this method of fishing, and enjoyed seeing what was under the surface. They caught several fish this way, including two large lobsters. As the moon came up over the mountain, it became harder to see beneath the water, so they gave up fishing. Hektorović then slept while the fishermen rowed back to Tvrdalj and Stari Hvar. It’s interesting that Hektorović refers to the town as Stari Hvar, not Stari Grad as it’s now known. The name of the main settlement on the island was transitioning from the old town of the Greeks (Pharos) and Romans (Faria), to the new Venetian commune on the south shore, then called new town – Novi Grad, now simply known as Hvar.